Just a Guy’s monthly music article includes the top songs of April 2014. The restrictions are simple, the album or the song must have been released during the month in review. So as to encourage musical diversification, we only select one song per album per artist. With all the stipulations out of the way, let’s take a look at the best songs from April. Cloud Nothings are a throwback band. They sound like a teenage garage band (except that they’re really really good). “No Thoughts” is a driving song off of Here and Nowhere with tight guitars and furious drum work. Vocally, the song builds to a borderline scream to close out the track. Manchester Orchestra is poised to break out this summer, with a new album and large tour the band is ready. “Cope” is the title track and follows the loud-soft-loud pattern that Nirvana employed so well twenty years ago. Andy Hull’s unique voice pushes the song, but it’s the heavy guitars that give the song life. It’s an instrumental. I love it. Jack White doesn’t need words on this track to make work. There’s a nice piano interlude, but for the most part, White lets his guitar talk. Fuzzy and in overdrive, the guitar speaks quite well. “High Ball Stepper” instantly got me excited for his new album. The best track off of Future’s album Honest. It’s a Mike Will beat, so it’s a banger, the type you turn up in your car. The song has guest spots from Pusha T, Casino and even Pharrell, who takes some time to jump from the pop charts to hip hop. A great song off of a good album. Neon Trees make easy pop music that can be fairly catchy at times. “Text Me In The Morning” follows the same formula that the band has always used, upbeat tempo and a big hook. The band isn’t reinventing the wheel here, just doing what they’ve always done. The lead single from Chevelle’s newest album is “Take Out the Gunman” and follows the path of quality rock songs that the band continues to produce. It’s hard picking the best song from the La Gárgola album but this track is right at the top, if not the absolute best. “Cry” is The Used’s version of a love song. Lyrics like “love is not a battle, it’s ticking time bomb” encompass the feeling driving this track. This comes off of Imaginary Enemy which was released on April 1, no fool’s joke here. “My Dying Time” comes from, Zakk Wylde’s band, Black Label Society’s latest album Catacombs of the Black Vatican. 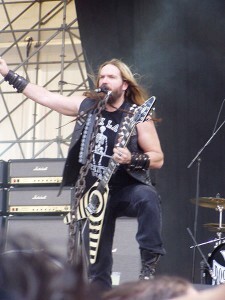 It has everything you’d come to expect from a Zakk Wylde track: strong bass, heavy drums, and some sweet guitar action. This is rock that everyone can enjoy. Sevendust’s latest album, Time Travelers & Bonfires, is all acoustic and includes some re-releases as well as six brand new tracks. “Come Down” is one of those new songs and leads the way as the first on the album. It’s a unique sound for Sevendust and is basically a toned down version of the harder rock they’ve traditionally produced. Breathe Carolina is an relatively unknown electronic rock band that has been putting out music since 2007. “Bang It Out” is a feature from their fourth studio album entitled Savages. For those not quite EDM heads, Breathe Carolina is a nice leeway before going full rave.